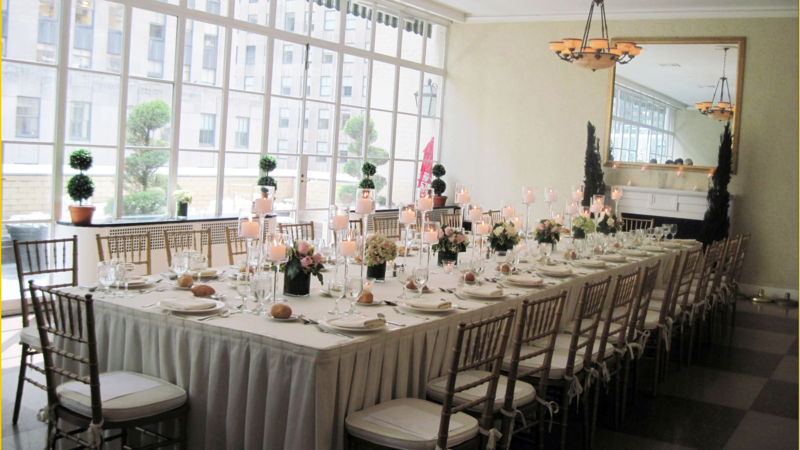 Rent 3 West Club | Corporate Events | Wedding Locations, Event Spaces and Party Venues. Steps away from Fifth Avenue at Rockefeller Center, in the heart of Midtown Manhattan, the 3 West Club offers the grace and glamour of our historic building, seamless service, overnight accommodations, and first class cuisine. With over 7,000 sq feet of meeting space, we have the optimal setting for your corporate seminars, board meetings, private dining and elegant receptions. Our service team will work tirelessly to ensure your event is a success. We offer overnight accommodations to meeting groups, wedding parties and the public. Complete with crystal chandeliers, high ceilings, and art decor touches, the Club is centrally located off of 5th Avenue, just across from Rockefeller Center and Radio City Music Hall. A fabulous and convenient location in midtown Manhattan. We require you use our catering and bar service. Outside food and beverage is not allowed.